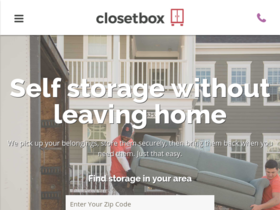 Use this coupon code today to save $50 off your first month of storage from Closetbox.com. Act now and save 30% off self-storage with the solutions offered by Closetbox.com. Enjoy a $25 discount plus free pickup and delivery with this coupon code from Closetbox.com. Check out Closetbox online for their latest special offers.